So who’s pumped Fall is here! Sad to see summer go, but happy to know cooler temperatures are rolling in, and Christmas is around the corner! Too soon? Yea I know. Don’t get me wrong, I’m not trying to rush through Fall but Christmas is my favorite time of the year and I eagerly await it’s arrival! I have also improved upon my blog scheduling this year over last, and I am able to get seasonal posts out in a more timely fashion. I hope you are inspired by what you read at Happy Haute Home and are able to incorporate some ideas into your life. In thinking about ideas for a Fall tablescape this year, I had no clue which direction I was headed. But all good ideas come from inspiration somewhere, and this year I got mine from the supermarket. It’s still a bit early to see pumpkins galore lining driveways, but grocery stores are slowly starting to stock up with Fall gourds and baby boos. During a trip this week to the supermarket, I found some unique veggies. When I saw these beautiful white acorn squash vegetables at the market, along with some ornamental gourds, a lightbulb went off in my head. 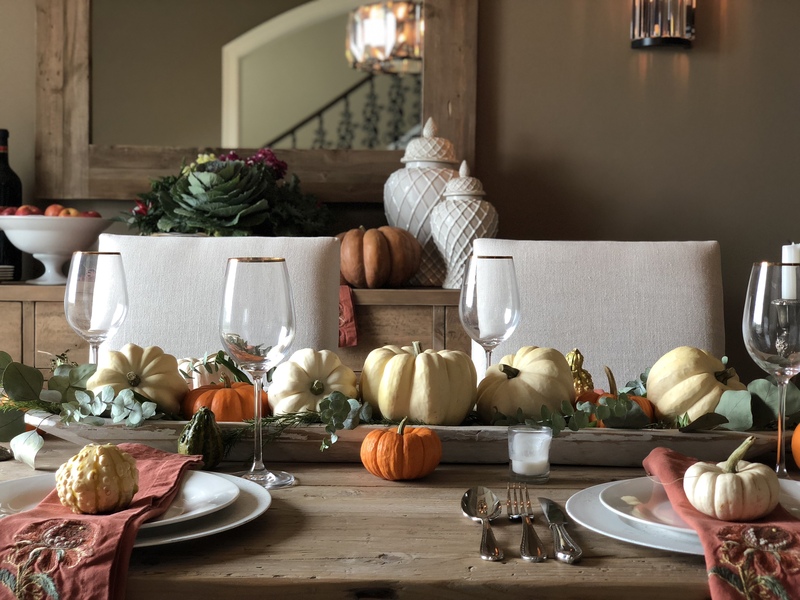 They are so attractive with bold curves and defined edges, I created my Fall Tablescape around these decorative elements. Using a white wooden trough, I arranged the acorn squash with some greenery lining the bottom of the trough, and added a few orange mini pumpkins. Wanting to keep the table fairly simple, I used chargers, plates, and napkins I already own. The natural wood finish of the table is a beautiful combination with Fall elements, so no need to add a tablecloth. These embroidered cloth napkins were purchased years ago from Pottery Barn and are still a key element in my Fall table decor. Adding in vintage candlesticks and votive candles adds a pretty glow to the setting. Simple wine glasses with a gold rim, purchased at Home Goods, are great for everyday or special occasions. A few scattered mini orange pumpkins add color and style to the setting. Ornamental gourds are fun to use in Fall decor. Their bumpy texture and unique shape creates an interesting vignette. Place them on a napkin, a plate, or the table. I try to make good use of the sideboard, by adding in interesting elements. A bowl of fresh apples adds a pop of color to the room while my favorite gingers jars Lattice Ginger Jars with a trellis motif, add in additional texture. These ginger jars sit in my dining room all year long. I put together a basket of cabbage, kale, peppers, and flowers as a centerpiece for the sideboard. Fresh grapes dangling off the side creates additional visual interest. The ornamental cabbage steals the show, with amazing broad leaves and vibrant color. Next to the basket sits an heirloom pumpkin, named Musquee de Provence. This pumpkin has a deep orange skin and is a “cheese pumpkin”, so named because it looks like a wheel of cheese. The pumpkin comes from France and was first introduced to American gardeners in 1899. My grocery store inspired Fall tablescape is simple and easy to put together. A little inspiration from the supermarket is all you need to create your own Fall setting. For more Fall Ideas check out these additional posts! Tag me on Instagram HERE if you create a table setting with ideas from this post. I’d love to see your tablescape with grocery inspired elements. You can also follow along on Pinterest HERE, and Twitter HERE and feel free to pin and tweet your favorite pics from Happy Haute Home. Fall is my favourite time of the year. I can’t wait to try out some of your fall tablescape ideas. Oh wonderful! So happy to hear that, and thank you for visiting. Hi, I am inspired by your Tablescape today. I am doing one with white and orange pumpkins with greenery in an antique wooden dough bowl. This is my favorite time of the year. Love to have a lot of Fall Mums. Happy Fall to you!! Hi Sandra! Yay!!! I’m so happy you were inspired. It’s such a beautiful time of the year to enjoy what nature brings…before the real cold sets in….brrrr…. So happy you like it Lynn! The wooden troughs are a bit tricky to find..if I ever find another like this one – I’ll pick it up for you! Hugs!